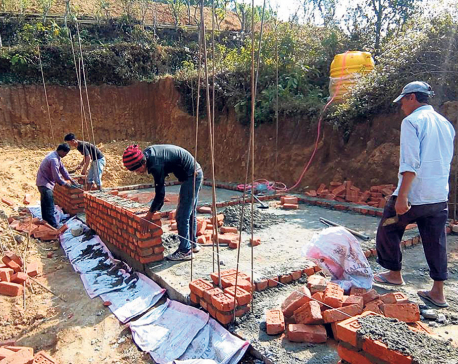 SINDHULI, July 11: After more than three years of the devastating Gorkha earthquake, about 20 percent of the reconstruction works have completed so far in Sindhuli, according to the National Reconstruction Authority. Houses are gradually being rebuilt after the devastation. As of now, construction of over 7,000 houses has been completed. Many families who had been staying in makeshift tents following the earthquake have now returned to their newly-built houses. The families which have completed the reconstruction have already claimed the third tranche of the government housing grant. The rush to reconstruct houses was noticed after the government set the deadline to claim the grant. According to engineer Aayush Mukhiya, over 22,000 families have taken the second tranche of the housing grant so far. More than 25 VDCs of Sindhuli district were severely affected by the earthquake. The National Reconstruction Authority said the pace of reconstruction has drastically increased of late.